Registration for Summer Camp is OPEN. Registration for Sport Intensive Camp will be an ADD ON. Please purchase the number of weeks you need camp and let us know which weeks you are interested in attending our Sport Intensive. In our sport-specific summer camps, your child can choose to focus intensively on one of our flagship sports-- rock climbing, parkour, or skateboarding! Each camp runs for 1 week, with different options available all summer long. Discount is available for multiple weeks. The EA Summer Climbing Experience will keep your child engaged all day long with chock-full sessions of climbing challenges, specially tailored both to beginners or those with experience! Each week, campers focus on building basic climbing techniques including footwork, sequencing, weight transfer, center of gravity, hand hold identification and body position awareness. Our experienced and enthusiastic climbing instructors will encourage wall proprioception through problem solving, strength and endurance based activities, leaving your child empowered with skills and fun memories that will last a lifetime. Climbers join us rain or shine! Make outdoor sports a part of your child’s life. Everyday Athlete’s Parkour Camp will get your child moving and exploring their environment like never before. This camp is perfect for beginners or those with experience! Each week campers will have in-depth instruction from our passionate coaches covering all the different movement patterns of Parkour, including running, jumping, climbing, swinging, rolling, and acrobatics! Using these skills, kids will learn how to safely approach parkour in the world around them, whether they are in the gym or outside. 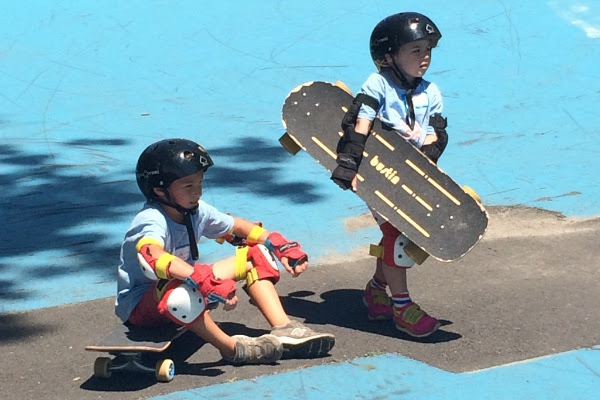 The EA Summer Skateboarding experience was created to engage children in the art of motion! This week long camp will teach the basic fundamentals of skateboarding with progressive skill building each day. From start to finish, children will learn about safety gear, perfect their ride with right and left feet in front, and progress to turning, slowing down, and learning tricks. Everyday Athlete’s motto is “Make the World Your Playground”, and we intend to do just that by utilizing our local park, specifically Squibb Park located in Brooklyn Heights, a skate away from our One Brooklyn Bridge studio!